The mob went along with the Sadducees and the Pharisees, the philosophers and the moralists. It went along with the imperial magistrates and the sacred priests, the scribes and the soldiers, that the one universal human spirit might suffer a universal condemnation; that there might be one deep, unanimous chorus of approval and harmony when Man was rejected of men. There were solitudes beyond where none shall follow. There were secrets in the inmost and invisible part of that drama that have no symbol in speech; or in any severance of a man from men. Nor is it easy for any words less stark and single-minded than those of the naked narrative even to hint at the horror of exaltation that lifted itself above the hill. Endless expositions have not come to the end of it, or even to the beginning. And if there be any sound that can produce a silence, we may surely be silent about the end and the extremity; when a cry was driven out of that darkness in words dreadfully distinct and dreadfully unintelligible, which man shall never understand in all the eternity they have purchased for him; and for one annihilating instant an abyss that is not for our thoughts had opened even in the unity of the absolute; and God had been forsaken of God. Of whom men say “He could strike giants down”? Arthur Pendragon holds a high place in the culture of our civilization – universal, always recognizable and yet always changing. In this – and in how he walks the boundary of myth and history – the king Arthur is like the outlaw Robin Hood. Robin Hood is a more human figure than Arthur, whose birth and death were marked by magical intervention and who was always entangled in otherworldly things. The outlaw is merrier than the king, happier and freer in the greenwood than Arthur was in Camelot. Arthur is dated several centuries earlier than Robin Hood, which may account for the paganism in the Arthurian legends. Robin Hood certainly never consorted with fairies and half-fairies, nor did he owe his bow to another world, or his life to enchantments. Neither, for that matter, did he ever go on a holy quest. The Merry Men never sought the Holy Grail. There is, in the vast web of stories around Arthur, a tension between paganism and Christianity. In the tales of Robin Hood, pagan Britain has surrendered to Christian Britain, and new ambiguities creep through the stories. The villains, in the ancient ballads, will take Christian oaths; “by the rood” Robin will swear, and so will, on occasion, the sheriff of Nottingham. Robin Hood casts in his lot with some men of the church, and robs others; to the unmerciful Bishop of Hereford he declined to show mercy. The greatest commonality between King Arthur and Robin Hood is the fascination they have so long and so widely enjoyed, and the consequent endless retellings of their tales. Anyone may tell his own version of Arthur or Robin Hood, and many people have. Today the CSFF tour begins a review and a discussion of one of the latest versions – Merlin’s Blade, by Robert Treskillard. It may be that these fields of legends grew up from the seeds of lost history. No one really knows if Arthur ever ruled Britain or Robin Hood ever rebelled in it. But I think that most of us hope they did. One sometimes wonders – on these tours where we debate angel books and angel characters – what angels make of it all. Possibly they don’t make much. Heaven has more important business. Anyway, they have surely noticed by now that gaps in human knowledge are often filled by human imagination. God has set limits so that, though angels are always seeing us, we can hardly ever see them. Our knowledge of angels is so slight that Christians have had a diversity of views on them. Even staying within biblical parameters, we can imagine angels many different ways. Here is a brief sampling of angelic portrayals from literature written by Christians – two from our modern era, two from the era just before. We’re close now, so close than I can see that touching a Sabre’s wing may be the fastest way to lose an arm. I set to examining the nearest one. He’s gigantic, like Jake said. And his eyes are pure white, trademark white. Like Canaan’s. Like Helene’s. He has the celestial gaze of one who’d lay down his life for another. His skin, too, is white, so white it looks almost silver. His muscled arms and chest make Canaan look trim. But as much as I can find things to admire about his physique, it’s his wings that so separate him from any other angel I’ve seen. His shining shadow more than he. Like lunar angels back to Three cold flame. Gods are we, Thou hast said; and we pay dearly. Yesterday I mentioned G. K. Chesterton’s opinion that pagans practiced demonic rites because they knew they were terrible. Today I will provide excerpts from The Everlasting Man where he wrote this. This passage also touches on the issue of magic in Christian fiction, which Becky Miller raised in her post. I believe that Christians who categorically reject all “magic” in fiction are misguided, but not as misguided as people who breezily accept all magic without a thought. Witchcraft, under all its various names, is a great evil, and also a great danger. If we are going to handle it properly – even in reading and writing fiction – first we must understand it properly. Chesterton wrote of the fictional King Dives: “The mills of God grind slowly, and he works with other mills.” And the root of both witchcraft and human sacrifice, as Chesterton illustrates in The Everlasting Man, is a desire to work with other mills. Whether it be because the Fall has really brought men nearer to less desirable neighbours in the spiritual world, or whether it is merely that the mood of men eager or greedy finds it easier to imagine evil, I believe that the black magic of witchcraft has been much more practical and much less poetical than the white magic of mythology. I fancy the garden of the witch has been kept much more carefully than the woodland of the nymph. I fancy the evil field has even been more fruitful than the good. To start with, some impulse, perhaps a sort of desperate impulse, drove men to the darker powers when dealing with practical problems. There was a sort of secret and perverse feeling that the darker powers would really do things; that they had no nonsense about them. And indeed that popular phase exactly expresses the point. The gods of mere mythology had a great deal of nonsense about them. They had a great deal of good nonsense about them; in the happy and hilarious sense in which we talk of the nonsense of Jabberwocky or the Land where Jumblies live. 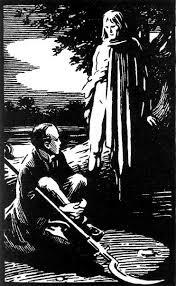 But the man consulting a demon felt as many a man has felt in consulting a detective, especially a private detective; that it was dirty work but the work would really be done. A man did not exactly go into the wood to meet a nymph; he rather went with the hope of meeting a nymph. It was an adventure rather than an assignation. But the devil really kept his appointments and even in one sense kept his promises; even if a man sometimes wished afterwards, like Macbeth, that he had broken them. In the accounts given us of many rude or savage races we gather that the cult of demons often came after the cult of deities, and even after the cult of one single and supreme deity. It may be suspected that in almost all such places the higher deity is felt to be too far off for appeal in certain petty matters, and men invoke the spirits because they are in a more literal sense familiar spirits. But with the idea of employing the demons who get things done, a new idea appears more worthy of the demons. It may indeed be truly described as the idea of being worthy of the demons; of making oneself fit for their fastidious and exacting society. Superstition of the lighter sort toys with the idea that some trifle, some small gesture such as throwing the salt, may touch the hidden spring that works the mysterious machinery of the world. And there is after all something in the idea of such an Open Sesame. But with the appeal to lower spirits comes the horrible notion that the gesture must not only be very small but very low; that it must be a monkey trick of an utterly ugly and unworthy sort. Sooner or later a man deliberately sets himself to do the most disgusting thing he can think of. It is felt that the extreme of evil will extort a sort of attention or answer from the evil powers under the surface of the world. This is the meaning of most of the cannibalism in the world. For most cannibalism is not a primitive or even a bestial habit. It is artificial and even artistic, a sort of art for art’s sake. Men do not do it because they do not think it horrible; but, on the contrary, because they do think it horrible. They wish, in the most literal sense, to sup on horrors. That is why it is often found that rude races like the Australian natives are not cannibals; while much more refined and intelligent races, like the New Zealand Maories, occasionally are. They are refined and intelligent enough to indulge sometimes in a self-conscious diabolism. But if we could understand their minds, or even really understand their language, we should probably find that they were not acting as ignorant, that is as innocent cannibals. They are not doing it because they do not think it wrong, but precisely because they do think it wrong. They are acting like a Parisian decadent at a Black Mass. But the Black Mass has to hide underground from the presence of the real Mass. In other words, the demons have really been in hiding since the coming of Christ on earth. … In the ancient world the demons often wandered abroad like dragons. They could be positively and publicly enthroned as gods. Their enormous images could be set up in public temples in the centre of populous cities. And all over the world the traces can be found of this striking and solid fact, so curiously overlooked by the moderns who speak of all such evil as primitive and early in evolution, that as a matter of fact some of the very highest civilisations of the world were the very places where the horns of Satan were exalted, not only to the stars but in the face of the sun. Take for example the Aztecs and American Indians of the ancient empires of Mexico and Peru. They were at least as elaborate as Egypt or China … Swinburne, in that spirited chorus of the nations in ‘Songs before Sunrise,’ used an expression about Spain in her South American conquests which always struck me as very strange. He said something about ‘her sins and sons through sinless lands dispersed,’ and how they ‘made accursed the name of man and thrice accursed the name of God.’ It may be reasonable enough that he should say the Spaniards were sinful, but why in the world should he say that the South Americans were sinless? Why should he have supposed that continent to be exclusively populated by archangels or saints perfect in heaven? It would be a strong thing to say of the most respectable neighbourhood; but when we come to think of what we really do know of that society the remark is rather funny. We know that the sinless priests of this sinless people worshipped sinless gods, who accepted as the nectar and ambrosia of their sunny paradise nothing but incessant human sacrifice accompanied by horrible torments. We may note also in the mythology of this American civilisation that element of reversal or violence against instinct of which Dante wrote; which runs backwards everywhere through the unnatural religion of the demons. It is notable not only in ethics but in aesthetics. A South American idol was made as ugly as possible, as a Greek image was made as beautiful as possible. They were seeking the secret of power, by working backwards against their own nature and the nature of things. There was always a sort of yearning to carve at last, in gold or granite or the dark red timber of the forests, a face at which the sky itself would break like a cracked mirror. There is an old legend of St. Barbara, patron saint of artillery and of those in danger of sudden death. And there are, I suppose, few better places to tell it than in the trenches of World War I. That lead to a low door at last; and beyond there is no door. Barbara, the saint of gunners, and a stay in sudden death. The verses that tell of Barbara have a simple, lyrical rhythm – four brief lines, the second rhyming with the fourth. The WWI verses are more complex, and not always easy to follow. Both are compellingly written, filled with wonderful phrases a nd evocative imagery. There are those who would point out that even if she ever existed, Barbara is not the patron saint of gunners, or of anyone else. But if it’s historical facts you’re after, you won’t be reading poetry anyway. The Ballad of St. Barbara is beautiful, memorable, touching chords of the heart – as a poem should. Nearly a year ago I got my Kindle. A few months after that, I figured out how to create highlights. Here are a few Clippings from my Kindle. That night, among the campfires of the Danes, five men sang by the fire in turn – the rhymester without a home, King Guthrum, and his three earls. Harold sang of the prizes of war, Elf sang of Balder beautiful, and Ogier sang about hate. Ogier was Rotten to the Core. Some villains are sympathetic; you can’t help feeling sorry for them, or you like them in spite of themselves. Some are even redeemed. Other villains are unchangeably evil, yet in some way admirable. Their courage, or persistence, or intelligence just rates it. And some villains are Rotten to the Core. There’s nothing in them to excite admiration, or liking, or pity. They are not redeemed, nor is anybody rooting for them to be. When such villains get their comeuppance, it’s wonderfully satisfying. Villains who are Rotten to the Core are among the dullest to ever stalk the annals of villainy. They are also among the best, generally when combined with other archetypes, such as the Scary Evil Villain. There was never anything remotely sympathetic about Sauron. He was evil! evil!, and we were all very happy to see him go. But while he lasted, he was an excellent villain – powerful, malevolent, and impersonal. Ogier, too, was a fine villain in his own right. There was little to him besides nastiness, but it was nastiness with meaning. 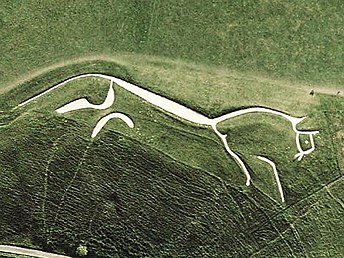 In The Ballad of the White Horse, the struggle between the Danes and British is part of, and symbolic for, the long war between Christianity and paganism. The Danes are pagans; they are almost paganism. Harold – the youth “the new wine of war sent wild” – exulted in the lawless strength of the Danes and boasted they would “enjoy the world, the whole huge world a toy”. Elf, the minstrel, sang beautifully the sadness of his pagan world. Guthrum, the conqueror who “read lines in Latin books when all the north was dark”, was intellectual, and atheistic, and despaired. And Ogier, with his vision of the last eclipse and the gods behind the gods, was nihilistic, full of rage and hatred – rotten to the core. SPOILER WARNING: This post will focus on the ending of The Napoleon of Notting Hill. If you don’t want it spoiled, stop reading here. But they would not listen. So Notting Hill went to war against a hundred allied cities, and Wayne went down with his army to die. My brother called the battle a Shakespearean slaughter. Chesterton killed – if not everyone, then at least he came close. Notting Hill was destroyed entirely. Watching the characters fall, I was startled and disappointed. I can still feel disappointed reading it again. But I am no longer inclined to criticize, because now I understand the purpose of it. The Napoleon of Notting Hill is a story about patriotism. In the last, unexpected twist of the book, Notting Hill dies, as all nations eventually must. And Chesterton confronts the strongest objection to loving a country. To end his story in grim failure was strange for G K. Chesterton. He wrote happy endings; in his novels I have read besides Notting Hill, I can recall only one character death, and that was of a minor villain. But it is only on the “field of the bloody end” that the question becomes so sharp. They ask, and answer again, what is the worth of Notting Hill – not in its triumph or in its weakness, but in its ruin. For a joke, Auberon Quin instituted the Charter of the Cities, making each municipality of London a sovereign city. Each city had its own guard, its assigned colors and heraldry. Each had a Lord High Provost, who could not put a letter in a mail-box without five heralds proclaiming the fact with trumpets. This was the King’s joke on his modern, businesslike subordinates. He enjoyed it and they did not. After ten years, the farce was interrupted by a lunatic, who took the whole thing as seriously as life itself. The Napoleon of Notting Hill was written by G. K. Chesterton and published in 1904. The novel begins in 1984, and it takes two time leaps so that it ends in 2014. This is enough to qualify The Napoleon of Notting Hill as speculative fiction, though its author never heard of the term. So the narration of Chesteron’s novels carries the same style and opinions as his apologetics. Indeed, the fiction of G. K. Chesterton always revolves around the same things his nonfiction does. Many of Chesterton’s ideas can be seen in the pages of this book – on what makes men go mad, on the value and almost mysticism of ordinary things, and why it is better to “go clad in gold and scarlet” than in black frock-coats. But the idea that shapes the whole story is that of patriotism. Adam Wayne was a lunatic because he was a patriot. He took Notting Hill seriously. Auberon had made the cities in mockery; he compelled them into mediavel glory for the pleasure of making his serious officials look like fools. He thought Notting Hill ridiculous, like the rest of it. The officials thought poor, small Notting Hill perhaps even more ridiculous than the rest of it. Adam Wayne thought it sacred enough to die for. This was singularly foolish to his fellow provosts, but also singularly inconvenient. They had strictly commercial – and highly profitable – uses for Notting Hill. A Lord High Provost who could not be bought – who resisted their seizure of his city to the point of violence – that was more than they had ever dealt with. Through the struggle for Notting Hill, the question is brought to fore: Is it rational to be a patriot? Is it sane to dress in gold and scarlet for glory, or to dress in black for dignity?